These are the words that Robert A. Johnson, III, MA, LPC, GCDF, lives by in his life. 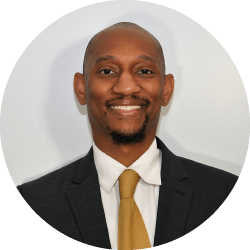 Mr. Johnson completed his Bachelor’s degree at West Virginia State College and finished his Master’s Degree in Counseling from Marshall University. Robert is a Licensed Professional Counselor in North and South Carolina. Robert specializes in the treatment of depression, mood disorders, anxiety, adjustment disorders, PTSD, anger/stress management, Christian counseling, life, business, and job coaching, vocational and occupational problems, couples/marital counseling, and family therapy. His interests include psychotic disorders such as Schizophrenia, learning disabilities, developmental and intellectual disabilities. Robert enjoys working with adolescents, adults, seniors, couples, and families. As a spiritually driven person, Robert is very active in his church and enjoys several activities including running, playing ball, and travel.